In the 1500s, navigation was described as the art of steering a ship by the shortest good way, by the most appropriate direction and in the shortest time. The principle of modern navigation is not any different. Yet, navigators at the time of John Cabot had only a few tools to work with: the magnetic compass, the log, the lead line, the quadrant or astrolabe, and dead reckoning. Generally for a trans-oceanic crossing, a navigator sailed south or north to the latitude of his target and then headed east or west until his destination was reached. By using either a quadrant or astrolabe to measure the angle above the horizon of Polaris (the North Star) at night, or the sun at noon, he could determine his latitude (the distance in degrees north or south of the equator). The quadrant was a heavy metal plate graduated in degrees - like a protractor in a student's geometry set with a plumb-bob (lead weight on a string) marking the angle. Hanging the quadrant in the rigging, the navigator sighted along the protractor's edge at the Sun or North Star and used the plumb-bob string to mark the angle. 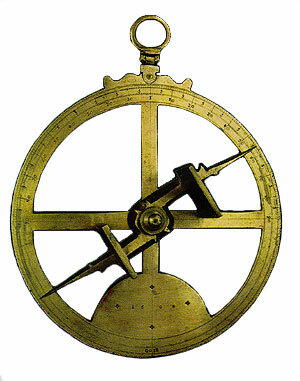 The astrolabe was similar. Descended from a far more complex Arabian instrument, the astrolabe was suspended from a cord to hang perpendicular to sea level, while the navigator sighted the sun or a star through two small holes in the plates on its moveable vane. The altitude of the celestial body could then be read from the graduated scale around the rim (The Explorers 94). If the navigator made sightings on the sun, he had to allow for its angle above or below the Equator. In June the sun is almost 23º north of the equator and in December almost 23º south of it. From Richard Humble and the editors of Time-Life Books, The Explorers (Alexandria, Virginia: Time-Life Books Inc., ©1979) 94. Photo courtesy of the Istituto e Museo di Storia della Scienza, Florence, Italy. The cross-staff was an early navigational instrument for measuring latitude. Also called a fore-staff, it consisted of a square-shaped staff marked off with a scale, and fitted with a sliding cross-piece set at right-angles to the staff. One end of the staff was held at the navigator's eye. The cross-piece was then slid forward or backward until its upper edge lined up with the sun or polar star and the lower edge with the horizon. The point at which the cross-piece cut the scale on the staff was noted and converted into degrees by referring to a table. The navigator of a vessel close to the equator saw the polar star close to the northern horizon. When taking a measurement from such a latitude he used a short cross-piece positioned close to the edge of the scale away from his eye. As a vessel sailed north and Polaris rose higher in the night sky, he moved the cross-piece further down the staff toward his eye. When it eventually went off the scale, he fitted a larger cross piece and repeated the process. Plate XVII. 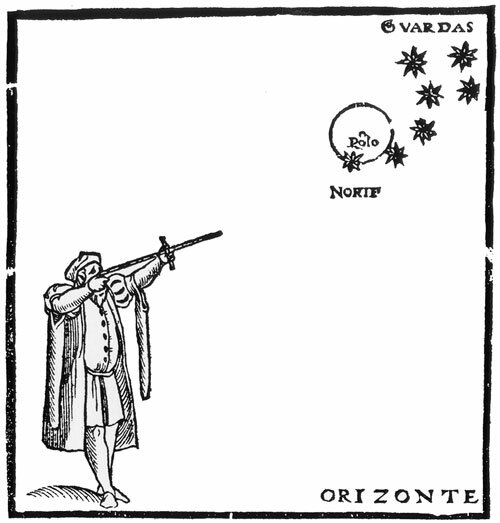 "Taking a pole-star sight with a cross-staff," 1545, from Pedro de Medina's Arte de Navegar, Valladolid. In David W. Waters, The Art of Navigation in England in Elizabethan and Early Stuart Times. (London: Hollis and Carter, ©Henry C. Taylor 1958) between pages 56 and 57. He followed the reverse process when taking a position from the sun. At noon near the equator the sun is nearly overhead in which case the navigator used the largest cross-piece. As a vessel sailed into more northern latitudes, the sun moved lower toward the southern horizon, requiring the use of a smaller piece. Each cross-piece had its own set of tables. The back-staff was a similar instrument for measuring latitude. However, it had the advantage of having the sun at the navigator's back rather than in his line of sight. The back-staff also consisted of a graduated staff. However, rather than a cross-piece, it had an arc shaped part attached that cast a shadow along the edge of the staff. To find the latitude, the navigator at noon stood with his back directly to the sun and the staff to his eye. Aiming for the horizon, he slide the arc-piece along the staff until its shadow touched the far end. The point at which the arc-piece cut the scale on the staff was noted and converted into degrees by referring to a table. The nocturnal, or night disc, was an early sea-faring navigational instrument of unknown origin. First described in 1272, it was improved upon in the early sixteenth century as a means of calculating the time at night (Clissold 236). It consisted of two concentric circles of different sizes, made of either wood or brass. The larger was divided into twelve sections to represent the months of the year; and the smaller was divided into twenty-four sections to represent the hours of the day. There was an index, or pointer, on the smaller circle which pivoted from the centre of disc. The instrument was placed at arm's length with the Polaris star clearly visible through a hole in the centre. The index or pointer was then calibrated to "rest" on an imaginary line connecting two stars in either of two orbiting star groups - the pointers of Ursa Major or the guards of Ursa Minor. The readings taken from these calibrations gave the hour of night (Kemp 599-600). A Nocturnal from H.M.S. Sapphire Sunk in the Harbour of Bay Bulls, NL. The Sapphire was a 32 gun, 5th rate, frigate that was in Newfoundland to protect the English migratory fishery. However, the vessel was trapped in Bay Bulls by four French naval vessels, and to avoid capture was scuttled in 60 feet of water on September 11, 1696. The nocturnal was excavated in 1977 by Parks Canada. Courtesy of the Department of Canadian Heritage, Parks Canada, Federal Archaeology. © Her Majesty the Queen in Right of Canada. Reproduced with the permission of the Minister of Public Works and Government Services, Canada. This instrument allows a navigator to establish true north or magnetic north. There is not an appreciable difference between the two in Europe, but explorers discovered that the difference increased in other parts of the world. Europeans had known for a long time that the lodestone had magnetic qualities. Initially a piece of the stone was floated on wood in a pan of water. This was followed by a magnetized needle floating on a straw in water, and then by a needle resting on a pivot point - much like the modern compass. The compass provided mariners with a rough or coarse direction, which they could supplement by noting the direction of the North Star, and of the sun at noon (south), and at sunrise (east) and sunset (west). Found during the archaeological excavation between 1978 and 1985 at Red Bay Harbour, Labrador. An artist's reconstruction of the compass found at Red Bay Harbour, Labrador. Illustration by Duleepa Wijayawardhana. Based upon a Carol Pillar sketch courtesy of Parks Canada from James A. Tuck and Robert Grenier, Red Bay, Labrador: World Whaling Capital A. D. 1550-1600. 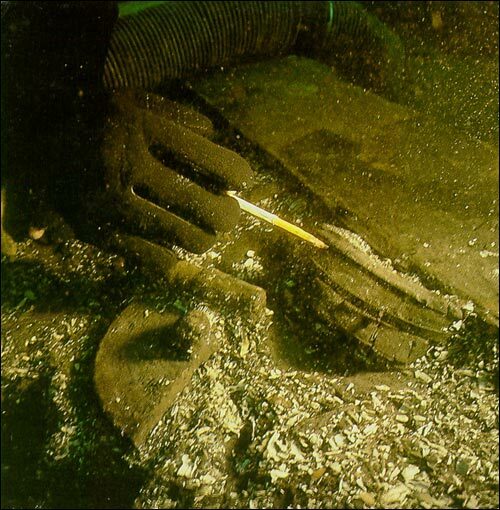 (St. John's, NL: Atlantic Archaeology Ltd., ©1989) 30. The navigator also needed to know the speed of his vessel. It is likely that this was first done by measuring the time that a piece of wood tossed overboard near the bow would take to reach the stern. Later sailors dropped overboard a small sea-anchor - a wooden triangle weighted on one side, with a rope attached to all three corners. The rope had knots in it, and it would be paid out for a fixed length of time as measured by an sand-glass. Speed was gauged by the number of "knots" that went out during that time. Eventually, the term "knot" came to mean one nautical mile per hour. Illustration by Duleepa Wijayawardhana. Based upon a Carol Pillar sketch courtesy of Parks Canada from James A. Tuck and Robert Grenier, Red Bay, Labrador: World Whaling Capital A. D. 1550-1600. (St. John's, NL: Atlantic Archaeology Ltd., ©1989) 31. Some people consider that this term originates from "Deduced Reckoning" which really means that the navigator figured out the ship's position from its speed and direction rather than from direct measurements. Navigators devised a simple peg board so that for each turn of the hour-glass, the helmsman marked off the direction (one of the eight cardinal points of the compass) and the speed during that time. The 15th century mariner lacked accurate positioning tools. Explorers such as Cabot had no charts. Those that followed him had inaccurate charts because the longitudes of the various points were largely inaccurate. Mariners much preferred navigating within sight of land, even if the trip was longer. Then they had points of reference. It called for great courage to navigate so close to land because the ship was in constant danger of wrecking on rocks and shoals. The fourth dimension of navigation (after latitude, longitude and time) is depth. Depth measurements probably predate any of the others. A navigator cast a lead weighted rope forward of the ship, allowed it to sink and when it touched bottom took up the slack. The length of a rope was measured by tying markers often at arms length called fathoms. Navigators calculated the water depth by identifying the point where the rope exited the water and counting the markers. The piece of lead tied to the end of the rope was often indented on the bottom and the indentation filled with tallow or fat. Small fragments of the bottom such as clay, sand, gravel, etc. would stick to the tallow. By examining sea bottom samples, navigators could often determine where they were. Would you consider taking a trip of several thousands of miles without a map? Cabot did that. Even in the world he knew, charts were unavailable. Printing presses were not known, so maps were individually drawn. Map makers were unable to relate correctly the relative position of distant geographic features. Instead, directions to get from place to place took the form of written instructions, called rutters. The ancient mariners did not sail in warm, dry wheelhouses 100 feet above the water, but on the open deck just a few feet above, and sometimes, in the waves. They became acutely aware of their surroundings. Land birds foretold of land nearby; swarms of fish and kelp identified shallows. The usual direction of winds and cloud types were all part of their intuition. Navigation in John Cabot's time was very coarse by today's standards. But his awareness of his surroundings, his prudence,and his courage allowed him to traverse the Atlantic and explore the island of Newfoundland and its rugged shoreline.